The morning of May 18, 1980 started like any other day on our property. I remember being in our makeshift kitchen baking bread when I noticed something dust-like blowing through our open structured dwelling. I ignored it at first, but over the course of a couple hours I noticed our tents, countertop, dishes – everything – was covered with a dark ash. It was only mid-morning but the sky was darkening rapidly so I rushed to our vehicle, turned on the radio and that’s when I heard Mount Saint Helens had erupted. We were only 40-miles, as the crow flies, from that mountain. Our home was still open to the elements so we had no protection and I had to make a quick decision. Do we stay exposed or do we go? We had to go. Breathing fine ash was not an option. It was divine intervention, but I didn’t know it yet. I got the kids and myself loaded in the vehicle. My husband chose to stay behind. I drove back to the Oregon Coast to take refuge, my headlights guiding us through the dark ash. It was scary. The air cleared the closer we got to the Coast and I was relieved to smell the salty coastal air. We stayed with friends for a week and I was able to get a bit of respite realizing how comforted I was by walls and running water. The simple things. After a week, the kids wanted to return to our mountain to see their dad, so off we went. 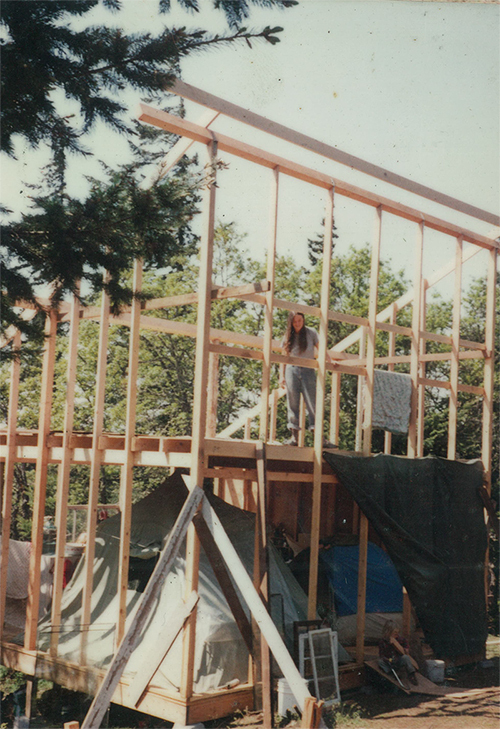 My husband had worked on the house while we were away – we had a wall – but it was not enough to make me feel like a queen coming back to her palace. Our time at the coast enjoying our friends and family, made me realize that this isolated pioneer lifestyle may not be for me. I really did my very best to keep a good outlook on the whole adventure, which was truly feeling more like insanity. I had babies now. This life was just not okay any more. My family would not visit. They didn’t even know how to find us. We had no physical address and picked up our mail at the post office 15 miles away. There was no cell phones, internet, GPS or anything of the sort. I was yearning for change and knew that living the pioneer life was not moving me forward. It was stagnant and difficult; all about survival. I kept thinking that my babies would be children soon and this environment wasn’t what I wanted for them. I knew life, for all of us, had to be more. It was time to take a leap of faith that would require complete surrender to whatever would come next. When Mount Saint Helens erupted and I returned to the Coast I knew I was home. This semi-desert property with one wall, no water, no power, rattlesnakes and extreme exposure was not my home. That summer a cousin came to visit, my one and only visitor, and as soon as he arrived he said, “Christy, what are you doing up here?” Oh God! To this day I remember the tone in his voice. I instantly felt so much shame. In that moment, I knew he was an angel and mentor. I had to stop this insanity. I had been longing to start a new chapter and with that one simple sentence, I felt empowered to leap. It was a few weeks after my cousin left when I finally decided it was time to load up and go home. As I backed the truck up to the house, my husband asked, “What are you doing?” and I said, “I am done! The kids and I are leaving. You can stay or you can come, but we are leaving.” I loaded our belongings and we slept one more night in the tents. The whole family, husband included, broke camp in the morning. We headed to the Southern Oregon Coast. There it is… a form of the Hero’s Journey. Our life, as insane as it was, was going along in an ordinary way. Something, a yearning for more, started to nudge at me and I dismissed it. The yearnings, nudges, started to compete with my daily routine. Something was erupting in me and then around me – volcanoes, mentors, common sense, babies. I shared and I participated in the pioneer dream, and it was time to move on. There was no going back. I took a new focus and knew I was making the right choice to transform my life. I went back to a community where I had strong connections. I had walls and water and faces of friends and family all around. Oh thank goodness, I was home!